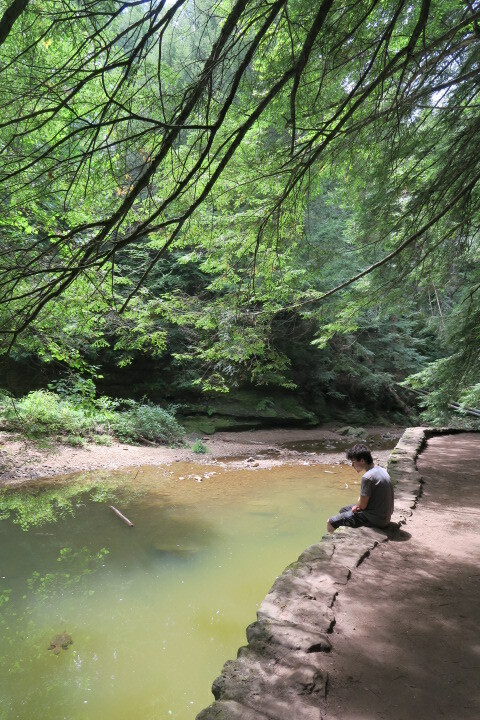 You won’t find a prettier place to hike in Ohio. Even though it was August and the waterfalls had all dried up to a trickle, this park was no less beautiful with its huge stone ledges and forest of pines, sasafrass, hemlocks, poplars, birch, oaks and about a zillion other trees and native plants that grow on the ridge tops and down in the damp, shaded gorges. 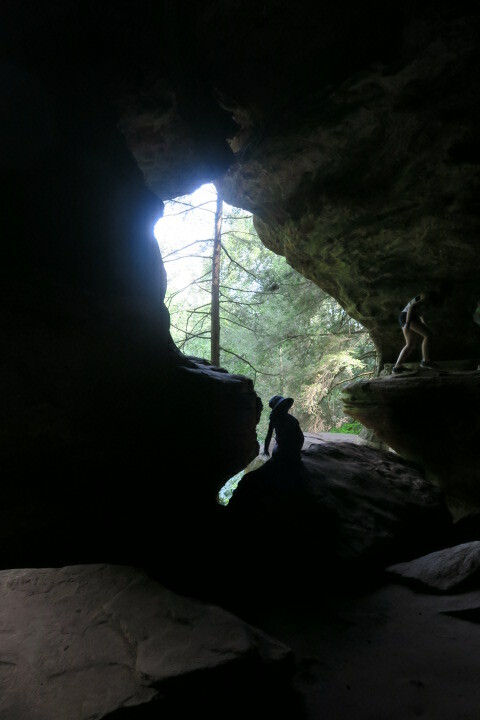 My family spent two days hiking the trails in Hocking Hills State Park. Since our last visit nearly 15 years ago attendance at the park has grown as locals and travelers discover this spectacular area. There were a few times on Sunday that we had trouble finding a parking place. Even on a Monday, the park was busy with other hikers. The Rock House trail was our first early morning stop. Well okay, when you’re traveling with teenagers nothing ever starts “early.” But it was sometime closer to breakfast than to lunch when we started our walk of what I considered the most difficult trail in the park. Difficult only because of the climb into and through the “rock house” which was totally dark in places with a slanted and uneven floor. 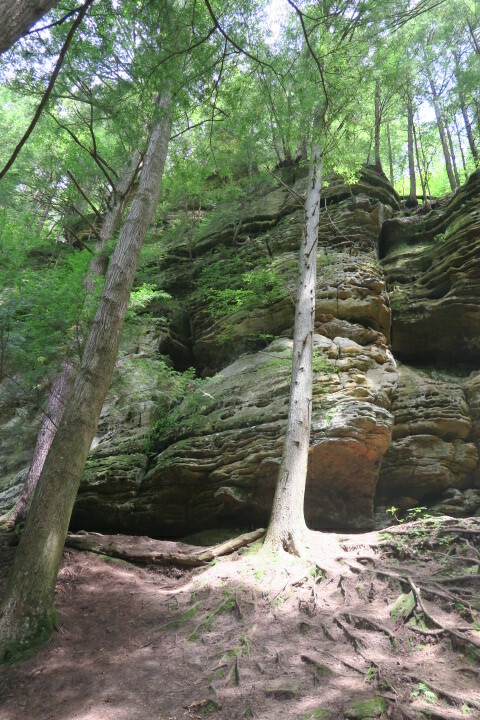 It is possible to follow the trail in and out of the gorge without climbing into the rock house but since the rock house is the main reason to hike the trail, it would be a shame not to experience it. And for any typical hiker it is easy to do. Our boys loved this trail. They tell you to watch your kids because there are so many places where it would be easy to fall. Yeah, well good luck. Our boys were running, jumping, and climbing everything. They loved it and lucky for us they are, at least, somewhat sensible. Time for lunch we chose to eat at the Hocking Hills Lodge Dining Room. This really is the ideal place to eat if you’re visiting the park. The food was fabulous. The large dining room has a full wall of windows overlooking a beautiful wooded view. We arrived and discovered that we were just in time for the Sunday brunch buffet. The buffet included salad, bacon and eggs, roast chicken, sliced turkey, roast beef and all the fixings that you’d expect to go with those entrees. Unlike most buffets, which are often hit and miss, everything I put on my plate was delicious. Our family didn’t find a single thing that we didn’t like. Lunch could not have been any better. Yes, it really was that good! the buffet line got a bit long at times, but if you were patient and just waited a few minutes, the line would dissipate, and you could walk right up to the buffet and get your “seconds” without standing in line. Our second hike on Sunday was the one to Cedar Falls. Most of the trails are 1/2 to 1 mile long. 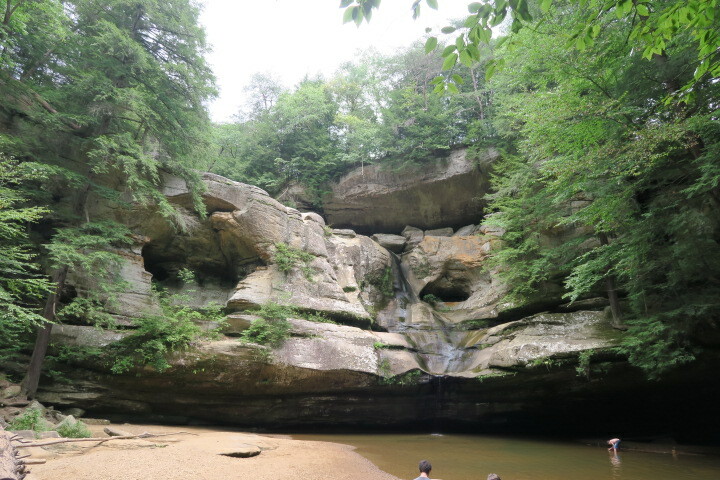 You can combine the Cedar Falls hike with the Old Man’s Cave hike to get a 6 mile hike if you want something longer. We did them as separate 1/2 mile each hikes. It’s possible to do several of these short hikes in a day. I stopped us at about 2 p.m. after just two hikes only because the day was so hot and humid and the temperatures zapped my energy. It would be a good afternoon to spend some extra time at the hotel pool, order a pizza delivered, and just relax. The following day, our final morning in the park before getting on the road for home, we hiked the Old Man’s Cave trail and hiked to both the lower and upper falls. At Old Man’s Cave there is a visitor center with some wildlife exhibits and a gift shop. Another beautiful hike, with stunning views around every corner, it’s impossible to say one hike is nicer than any other. Visit any portion of this park and you can’t go wrong.